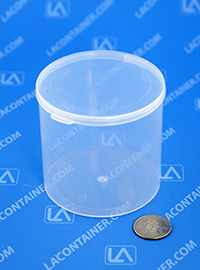 The Lavials® VL80L large hinged-lid lab vial is the largest of the Lavials® series, and is suited to store larger items such as electronic connectors, industrial machining components, and professional cleaning supplies. Manufactured in the USA with medical grade material, the VL80L can safely be autoclave sterilized and be used in laboratory or medical environments as a sterilized research sample container. 3.06" Dia. X 2.92" Ht. 82.04mm Dia. X 76.45mm Ht. 77.72mm Dia. X 74.17mm Ht.